It's all about snowflakes for this weeks Simon Says Stamp Challenge. 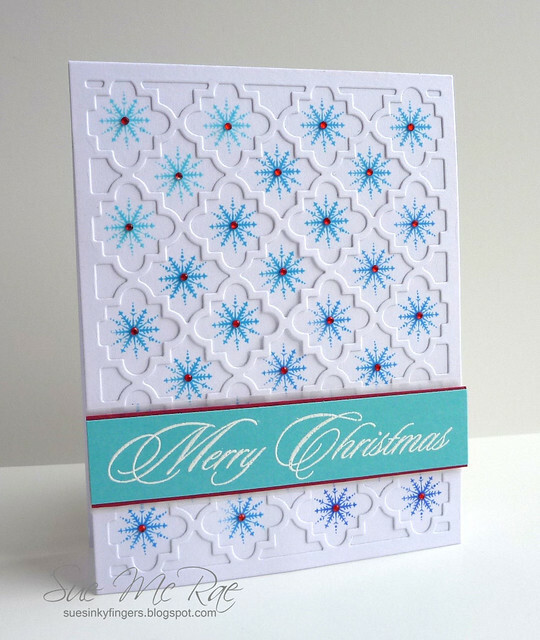 I inked up the snowflake image in four shades of blue and stamped the colours diagonally in the little "windows" that were created from Papertrey Ink's Quatrefoil Die. A simple embossed sentiment, a few gemstones and that's all folks! I JUST KNEW this was going to be stunning - I love it, Sue! Amazing design! Fabulous card, Sue! I love your design and the pretty colour combination! Your placement of the snowflakes behind the die cut panel is perfect! This is simply beautiful, Sue! I love it! Oh Sue, I have this die and would never think to use it that way! It is simply STUNNING!!! This is so striking, Sue - love this! This is SO pretty Sue! Love how you did this, and I just love how pretty the snowflakes look in those colors. Wonderful snowflake card! Thanks for playing along with the Snowflake Challenge over at the Simon Says Stamp Challenge Blog this week! What a beautiful use of the quarterfoil die!